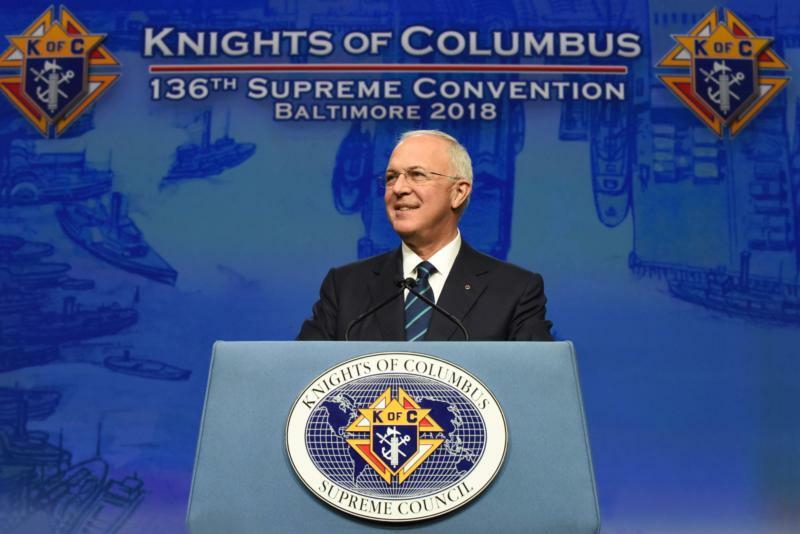 BALTIMORE (CNS) — In an opening address Aug. 7 at the 136th annual Knights of Columbus Supreme Convention, the organizations’ CEO, Carl Anderson, spoke of the charitable works of the Knights, their ongoing pro-life commitment and pledge to support persecuted Christians in Iraq and Syria. “The Catholicism first nourished here in Baltimore contributed to the American experience through other commitments as well — commitments that could be summarized in this simple, but powerful Gospel insight: The person in need that we encounter is not a stranger but a brother or a sister,” he said. He told the Knights at the annual gathering that they gave more than $185 million dollars to charity last year, an $8 million increase from the previous year and one of the largest yearly increases in the organization’s history. The Knights also donated more than 75.6 million volunteer hours. He said they particularly came to the aid of hurricane victims in Texas, Florida and Puerto Rico raising $4.2 million dollars for disaster relief. Anderson said he recently visited Puerto Rico. At one stop, he visited an orphanage and a school for girls that had taken a direct hit. As the storm ripped the roof off their building, the sister in charge huddled with the girls in the school library to protect them. Five months later, he said, the roof was not repaired and the girls in the orphanage were still in temporary homes. He gave the woman religious a check for $50,000 from the Knights of Columbus to make the needed repairs. “We will continue to set new records for charity. But you know it is not about numbers, it’s about the lives that we change,” he said. “We show that we care and that the poor and the marginalized and the broken are not forgotten. Through our time and money, we change lives in ways that only we can — because we make a fraternal difference. We treat them like a brother or a sister,” Anderson added. He also stressed that the Knights continue to defend the culture of life from conception to natural death. One way they do this is through donating ultrasound machines, so parents can choose life over abortion when they recognize the life they created. “I’m pleased to announce that we have already placed more than 950 ultrasound machines and that we will meet our goal of 1,000 later this year,” he said. He added that the Knights will remain at the forefront of the annual March for Life in Washington along with supporting other pro-life marches around the country. He also urged very Knight and all Catholics to join the U.S. Conference of Catholic Bishops in a nationwide Novena for the Legal Protection of Human Life every Friday until Sept. 28. “On this issue we will not yield. We will never give in,” he said. “The simple, hard truth,” he said, “is that Christians are on the verge of extinction in the Middle East. We must not allow this to happen. Closer to home, the Knights distributed more than 105,000 new coats to children and provided nearly 4 million pounds of food and nearly $2 million through our Food for Families program. They also donated 7,649 wheelchairs through our partnership with the Global Wheelchair Mission. The Knights also donated more than $3.8 million to 6,348 seminarians and postulants through our Refund Support Vocations Program. On the business side, he said the group sold $8.8 billion in new life insurance last year in its 17th consecutive year of growth. Its assets are more than $24 billion and income before dividends was more than $305 million. He also said recently Standard & Poor’s listed the Knights of Columbus as one of the six strongest life insurance companies in North America. Numbers also are up for the Knights; its membership now totals 1,967,585 members.